I’m fascinated by the medicinal and cosmetic benefits of Rakta Chandan (Red Sandalwood) and apply its paste whenever an ugly pimple sprouts up and I must admit that it dries up the zit exceedingly well and the paste (Red Sandalwood Chips /Red Sandalwood powder) itself in combination with Rose water, when used as a face pack, is extremely cooling and soothing to the skin. Incidentally both sandalwood (chandan) and red sandalwood with their antibacterial and coolant properties are ideal for dealing with summer skin woes. 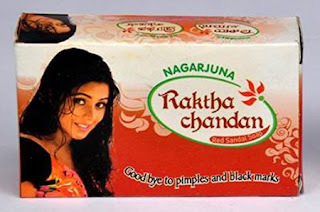 So when I happened to notice this soap named as Nagarjuna Raktha Chandan soap at a mall, I immediately purchased it. Nagarjuna Raktha Chandan Soap. Buy from here in India. This refreshing body soap has therapeutic properties, relieves skin irritations, rashes, itching and gives nutritional support to your hair and skin. It is a rich botanical treat for your skin and will give you a soothing and rejuvenating feel throughout the day. This Soap is ideal for sensitive skins. It does not give any dryness but nourishes your body and mind. aah.!! I totally forgot to buy this.Thanks. I am using this soap from 3 months.. It is very benefiscial. and simply works superb. I have been using this soap since 3 week now n seeing it's visible benefits as my pimples are getting suppressed. I has become the new lover of this soap.